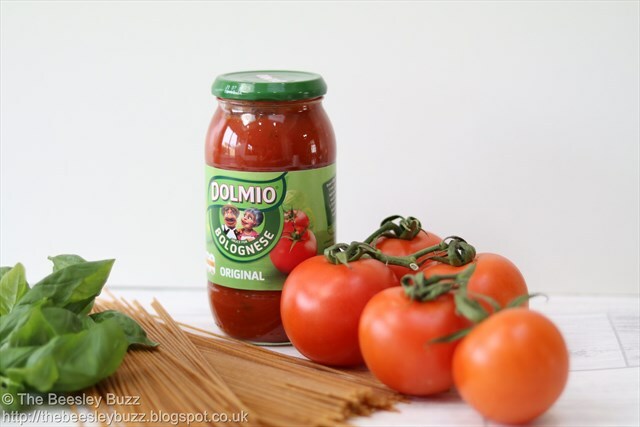 > The Beesley Buzz: Thank Goodness for Dolmio to get us through the week! 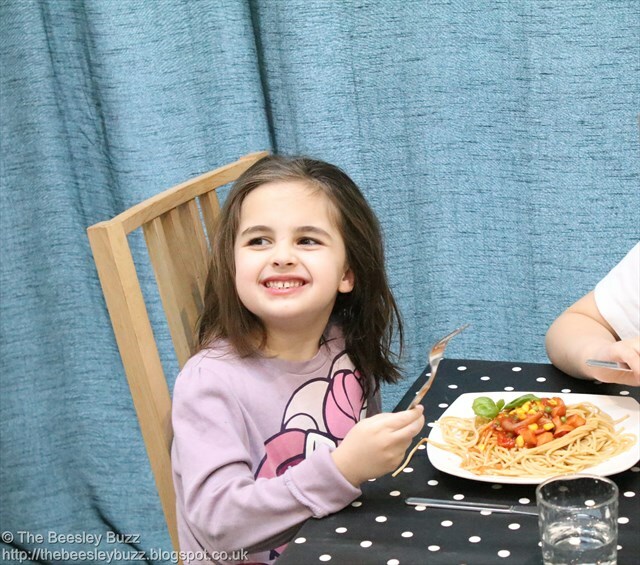 Thank Goodness for Dolmio to get us through the week! 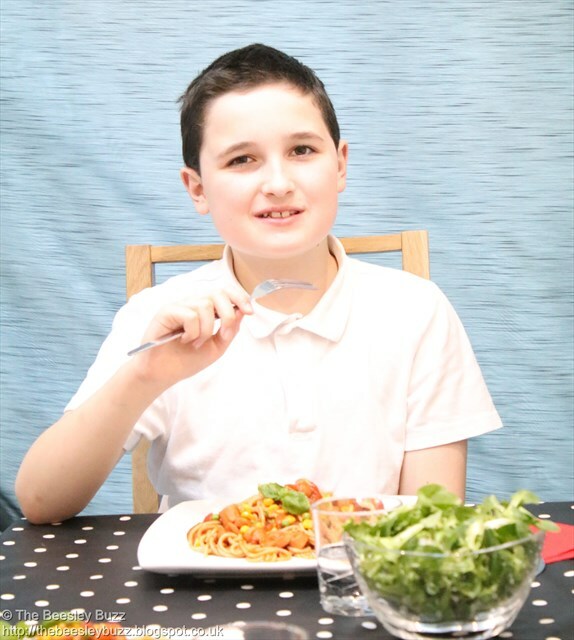 Although I wasn't speedy enough to be one of the lucky bloggers getting a Dolmio delivery, I always keep a jar of Dolmio in the cupboard for those mid-week meals that need to be quick and easy and still get that all important nutritional goodness into the kids. 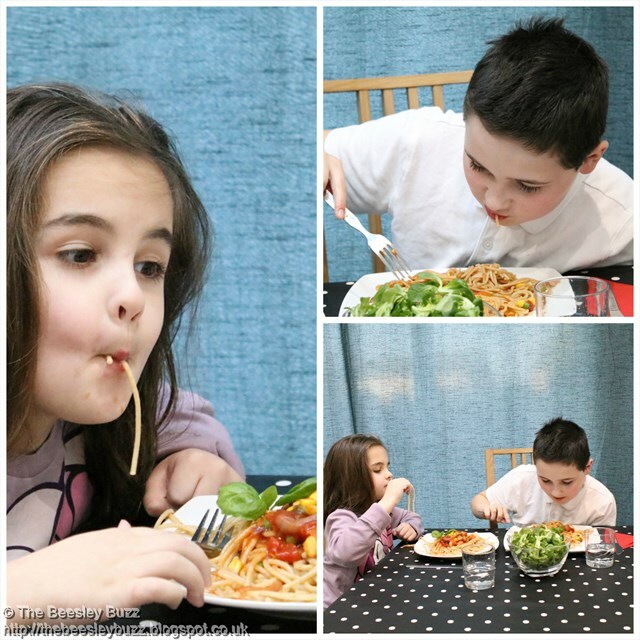 The kids are so busy after school with music lessons, youth club, boys brigade and other activities that it really can be a rush at dinner time. So I was keen to come up with something mega speedy that could be rustled up in minutes and that tasted really good too. 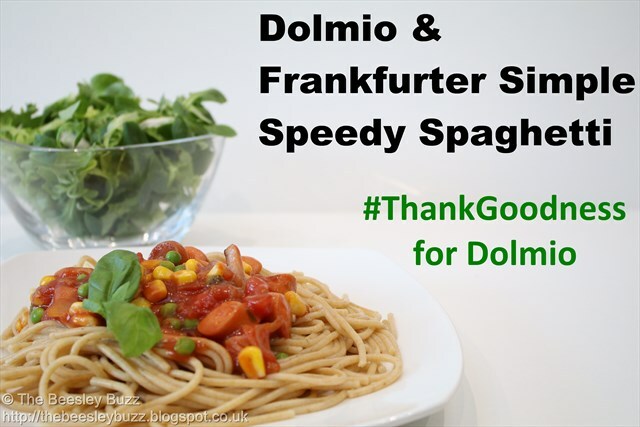 So #ThankGoodness for Dolmio. I threw in some other storecupboard (and freezer ingredients) and hey presto - speedy, tasty and nutritious dinner. If you've not picked up a jar of Dolmio recently, I'd really recommend taking a look at the great infographic on their website. How brilliant that a whopping 10 tomatoes goes into every 500g jar! 2. Fry the red onion in a little rapeseed oil. Chop the frankfurters into slices and add until browned. 3. Add the frozen peas and sweetcorn, followed by the jar of Dolmio. 5. 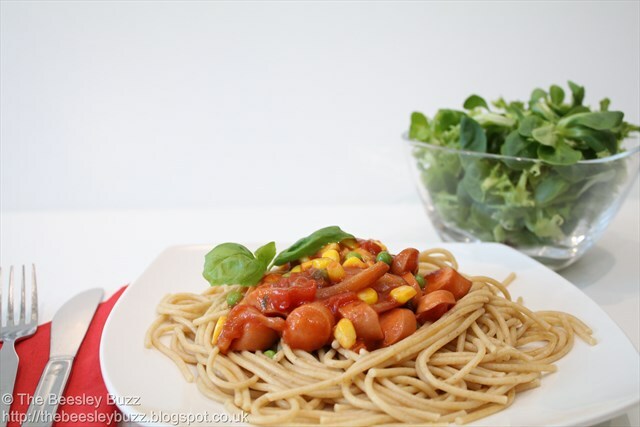 Serve the spaghetti and the Dolmio and frankfurter sauce on top or stir it all together as you prefer. 6. 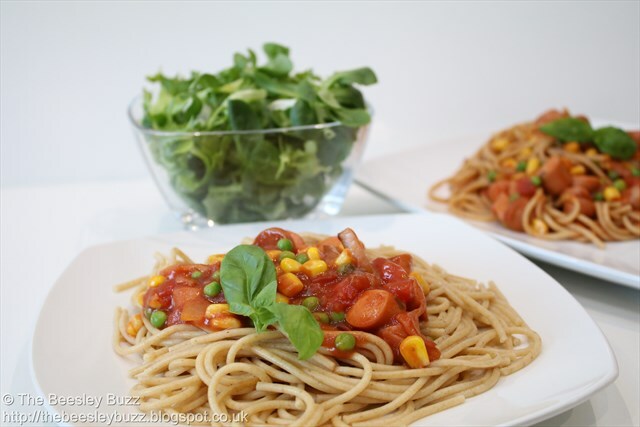 Serve with basil or salad as you wish. SO simple. SO speedy and tastes SO super! And here's the bonus...A second speedy meal the following day. 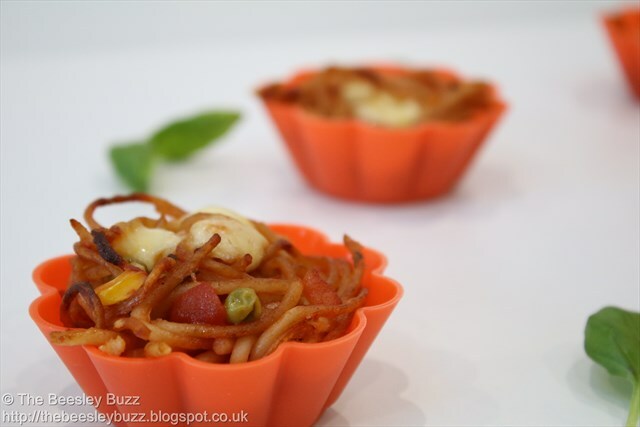 With the leftovers, simply lightly greased either a muffin pan or silicone cupcake cases, place little nests of the spaghetti and Dolmio mixture into them, Top with a little crumbled cheddar and pop in the oven at 180C for approximately 15-20 minutes. 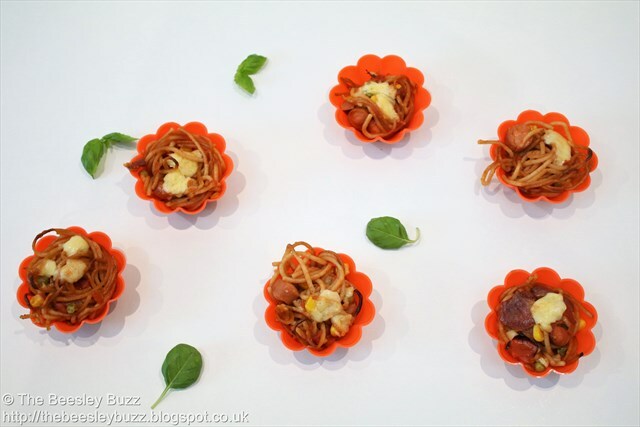 You end up with cute little spaghetti nests that the kids will just adore!